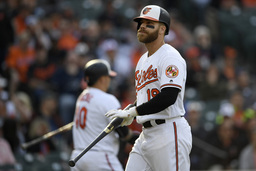 BALTIMORE (AP) The new regime of the Baltimore Orioles inherited a costly problem in slumping slugger Chris Davis, who's working with a $161 million contract yet can't buy a hit. After batting .168 last year - the lowest average by a qualifier in major league history - Davis opened this season going 0 for 17 with 11 strikeouts. Combined with an 0-for-21 finish in 2018, he's looking for his first hit since Sept. 14.